A Linux User Group or Linux Users' Group (LUG) or GNU/Linux User Group (GLUG) is a private, generally non-profit or not-for-profit organization that provides support and/or education for Linux users, particularly for inexperienced users. The term commonly refers to local groups that meet in person, but is also used to refer to online support groups that may have members spread over a very wide area and which do not organize, or which are not based around, physical meetings. Many LUGs encompass FreeBSD and other free Unix-based operating systems. Local Linux User Groups meet (typically weekly to monthly) to provide support and/or arrange and host presentations for Linux users, particularly for inexperienced users. Given that Linux is not dominated by any specific corporate or institutional entity, LUG meetings typically encompass a broader range of topics than the meetings of other users' groups. Linux is predominantly user supported and some support is vastly easier via phone or in person than over e-mail or USENET. LUGs are still primarily focused on hobbyist users and professionals who are engaged in self-directed study. SVLUG is among the oldest and largest LUGs. 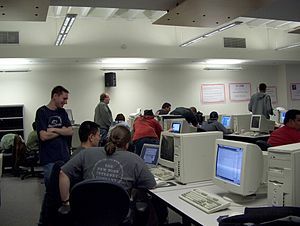 It was originally formed as a Special Interest Group for the Silicon Valley Computer Society, founded by Daniel Kionka to support Xenix and "low cost PC UNIX systems" (which later became focused on Linux as the dominant free implementation of Unix). LUGs typically meet once per month in facilities freely provided by universities, colleges, community centers, private corporations, or banquet rooms in restaurants. For example, the SVLUG of the Silicon Valley met for about 10 years in the back of a Carl's Jr. restaurant, and has met for the last several years in meeting rooms at Cisco Systems and, more recently, Symantec. Similarly, the BALUG (SF Bay Area LUG) has always met in a banquet room above the Four Seas Restaurant in San Francisco's Chinatown. Most LUGs are free, requiring no monthly or annual dues. In many cases the participants are encouraged to patronize the hosts (esp. in restaurant meetings, by buying dinner). Some LUGs are informal conferences or round table discussions; members simply sit around and chat about Linux related topics. Some provide formal presentations. For example Linus Torvalds has occasionally talked to SVLUG or BALUG (which are close to his former home in Silicon Valley), and Hans Reiser (creator of ReiserFS) presented his early design plans at an SVLUG meeting. Presenters might be anyone in the community with something interesting to say. Occasionally, corporations will sponsor or encourage their employees to speak at users' groups to promote their products. LUGs generally require that these presentations provide technically interesting content rather than overt sales pitches. Often, LUG meetings provide an opportunity for members and guests to make announcements, especially for jobs offered and/or wanted, pleas for assistance (free or professional consulting), and hardware for sale or to be given away "to a good home". LUGs in close geographic location would get together to hold conferences and share knowledge among peers. Like in Central America, in 2009, the first Encuentro Centro Americano de Software Libre was held in Nicaragua. Where LUGs from the region, from Belize to Panama attended. Groups from other countries are also invited. In 2010, it was held in Punta Renas, Nicaragua; where there were members from the region, including from Germany and Mexico. In 2011, it will be held in El Salvador. These events usually take place in summer, as most of the LUG members are students. Many LUGs also organize installfests (FreeBSD groups tend to refer to them as "installathons") which are opportunities for experienced Linux users to help others, especially novices with installation and configuration of Linux systems. Installfests may also have break out sessions for teaching new tips and tricks—performance tuning, security hardening, etc. A few LUGs have developed projects of regional or even international stature. For example, the Uganda Linux User Group operates in 3 major cities and frequently coordinates national and international events which have featured guests as high-profile as Tim Berners-Lee. The Bellingham Linux Users Group (BLUG), in Bellingham, Washington, holds the annual Linuxfest Northwest, which attracts large numbers of participants from throughout the region, including Western Canada. Likewise, Bellevue Linux Users Group (BELUG), which meets in a bookstore in Bellevue, Washington, has developed The Linux Information Project (LINFO), a comprehensive online resource that receives hundreds of thousands of hits monthly from around the world. LUGs sometimes are gifted with surplus books, back issues of Linux magazines, copies of CDs and other promotional items to give away to their members. Other than these "official" LUG activities the meetings provide opportunities for users to socialize. Members often exchange e-mail addresses, URLs, and phone numbers and provide technical support or collaborate on study or development projects together. Some local LUGs share characteristics of online LUGs, meeting on IRC or hosting support mailing lists in addition to the physical meetings. LUGs may also have an online blog presence, an example is the OSU LUG or the Nottingham LUG whose Planet NottsLUG is an aggregation of various members' blogs. An Installfest (a portmanteau of installation and festival) is an event, generally sponsored by a local Linux User Group, university or LAN party, at which people get together to do mass installations of computer operating systems or software, most often Linux and other open source software. It is generally an advocacy and community-building event, where novices bring their computers along with their preferred operating system installation disks to the location of the installfest, and experienced users help them in getting started and troubleshooting problems. Sometimes a Linux distribution and informative flyers are given for free to the attendees. Some events ask for participants to bring power strips and network switches if available. Installfests welcome all skill levels from complete novice to expert. An installfest will range from an informal get together to festivals involving music. The tone and scope of a specific event will depend on the organization sponsoring it. The Ubuntu Global Jam includes installfests. A Hackfest (a portmanteau of hack and festival) is an event, generally sponsored by a local Linux User Group, university or LAN party, at which people get together to demonstrate security issues or reverse engineer computer operating systems or software, most often Linux and other open source software. Not all online Linux support groups refer to themselves as "a LUG", and the use of the word is sometimes (as in the Linux User Group HOWTO) intended to specifically refer to groups of Linux users which organize regular meetings. However, the LUG indexes list groups with members over a large geographical area, and over time, organizations like the EU LUG, for Linux users throughout the European Union (as of 2005, apparently defunct) use the term LUG to refer to themselves. Online LUGs use mailing lists, bulletin boards and IRC as their primary method of communication, with members meeting physically seldom or not at all. As with local LUGs, some groups are limited to technical discussions and others seek to form social bonds between Linux users by having "chat" or "off topic" forums. Reasons for forming or joining an online LUG vary. Some members of online LUGs may be relatively isolated without a local LUG accessible or with only a few other Linux users in their area. Some Linux users are dissatisfied with their local LUG for reasons that might include its size, insularity or atmosphere: the online group LinuxChix, which is a worldwide LUG and social group for women Linux users, was founded due to the perceived aggression and rudeness prevalent in other Linux forums. The potential member base of an online LUG, as with other online support groups, make them suitable for people seeking help with more obscure or difficult problems. Some Linux users are part of both a local LUG and an online LUG. An EC funded study (2006) summarized in the Flosspols report, indicates that about 1.5% of FLOSS community members were female, compared with 28% in proprietary software. The Ubuntu Census Survey (June 2006) also reflects a similar female ratio with 2.4% women actively volunteering in the Ubuntu community. Ubuntu-Women seeks to balance and diversify the Ubuntu Community by actively engaging in discussions with women and encouraging them to participate and become more involved within the Ubuntu community. Debian-Women seeks to balance and diversify the Debian Project by actively engaging with interested women and encouraging them to become more involved with Debian.